Home Internet Exchange Point Internet Governance What is an Internet Exchange Point (IXP)? It has been a while since my last post published in this blog, while I was busy contributing to the blogs other than my own, so my apologies to my chilled (mynetworkinglabs.com) and its followers. Let me be honest with all of you, I might have not been able to write even this post, if I had not started working on my university thesis (Understanding the Importance of Internet Exchange Points in today’s Internet Ecosystem – from Afghanistan’s prospective). But I assure you to keep feeding this blog with new posts by sharing the most relevant topics from my Thesis while I keep writing it. Especially from the BGP configuration Chapter. So without wasting much of your time, let’s get back to the main topic. The Internet is a collection of thousands of private networks that-interconnects and create the ‘network of networks’ that has reduced the world to a global village by enabling individuals to communicate easily and quickly, thus has also greatly impacted communication. The Internet has also changed the traditional ways of buying and selling and has transformed commercial activities. As of Jun 2017, 51.7% of world’s population is on Internet, which means half of the world is still unconnected. The gap between those who are connected to the Internet and those who are not is known as Digital Divide. There are many factors causes the digital divide out of which availability of access and affordability are two of them. The Internet’s physical infrastructure plays a big role in bridging the Digital Divide. The way how the Internet is connected and how the packets are routed does not only impacts on bridging the Digital Divide but it also plays a big role in the economy. An Internet Exchange Point is a physical infrastructure that inter connects Internet Service Providers (ISP’s) and Content Delivery Networks (CDN’s) to exchange Internet traffic in order to keep local traffic local. The goal of IXP’s are to reduce the amount of traffic of an ISP that has to be delivered through their upstream transit providers to effectively reduce the average per-bit delivery cost of their service. If two networks located in the same area need to exchange data but are not connected to a local IXP, then they have to pass their data through their upstream transit providers. This incurs added costs and delays, as upstream providers charge them by capacity or utilization, and their traffic will often be passed through other cities before reaching its destination. The largest costs that any ISP faces are the upstream capacity costs of connection. To avoid these costs and other drawbacks associated with sending their traffic across a third-party network, member companies connect with each other in these special IXP nodes to cut down on costs and shorten distances. These kind of connections intended to exchange national or international IP traffic through an Internet Exchange Points are generally known as Peering. Peering is the exchange of traffic between ISP’s. These exchanges of data between ISP’s often takes place free and without charging each other, thereby the relationship is called settlement free peering, and in order to settle these terms ISP’s use settlement agreement. This helps to reduce the cost of IP traffic in a significant way, but it is not really important that these settlement agreement of transferring data should always be free of cost. For example, large networks with relatively equal share market may not charge other large networks for peering with them, while they might charge smaller networks for transit costs. In an IXP, member companies may have different way of arrangements with several different members. The Internet Subscribers are effected with the overall operational costs of the ISP’s. This costs can be reduced by proper management and utilization of the International bandwidth, which is very expensive, and as well as by increasing the domestic interconnectivity. As a result, the subscribers will experience better Quality of Services in a cheaper price while communicating locally. This can also increase the number of Internet subscribers tremendously. 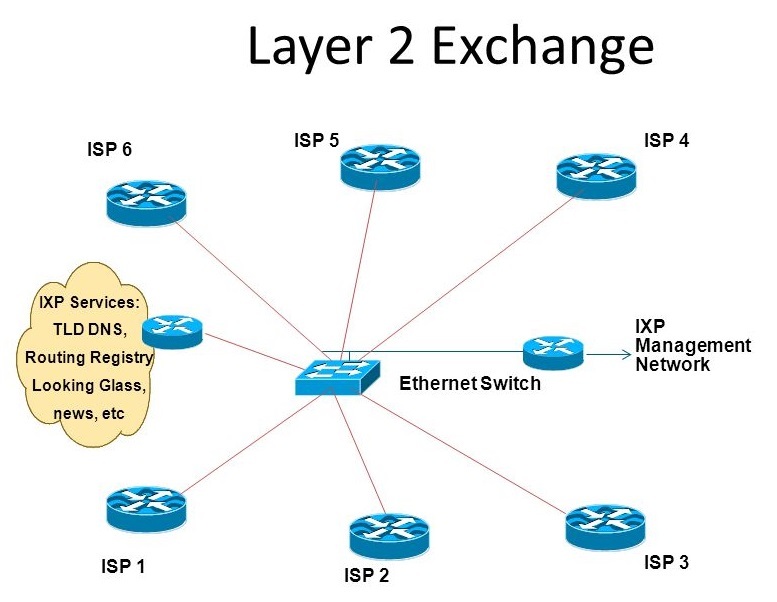 The Above picture shows a layer 2 Exchange point where different ISP’s are connected with a central Ethernet Switch and a server is offering common good services like TLD DNS, Routing registry and etc. The routers in the above design are brought by the member ISP’s in the IXP location. I will publish more about the IXP's and their role in the Internet Ecosystem in my upcoming posts. so stay tuned and keep reading.